THE TWITTERVERSE, 15 August — I’ve just finished my 2nd “TweetChat.” I do love Twitter, and TweetChat is a cool platform for turning Twitter into a group discussion. Still, it’s a strange space to me. 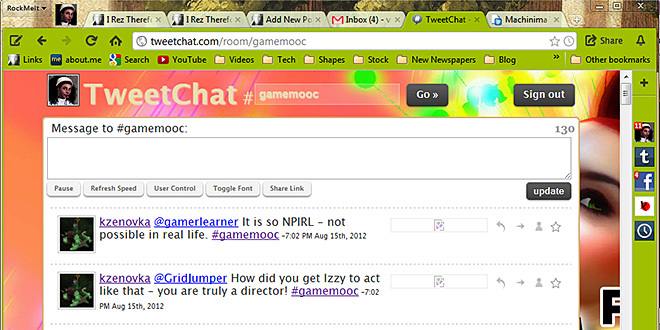 This Tweetchat was with Games MOOC, and the 1st was with Arts Management Chat. Both fantastic groups of smart, engaged, helpful peeps who really care. Good stuff. Good stuff. Tweeting just seems like such a strange platform for a substantive conversation to me. Twitter does foster plenty of interaction and making connections, so maybe the “problem” isn’t the platform buy my perception, IDK. I love the peeps and what they’re trying to do, it just seems like a lot of retweeting and maybe a bit less space for new ideas – not no space, but maybe less. I love what everybody’s doing, I just wish there was a conceptually deeper platform to talk about it on. After months on Twitter now, I have yet to have a substantive conversation there. I don’t blame anyone but myself, because clearly there are those who are having the times of their lives on Twitter. I’ve often thought that there is something about it that I just don’t get. Maybe it’s the interface, but I’ve tried other Twitter viewers, with similar results. Maybe it’s the brevity? I’m not so sure, as my utterances in SL are probably on average not much more than 140 characters at a time. Maybe I just get a lot more out of the attention that can be paid to a focused thread of thought (like blogging), without being bombarded by a universe of randomness? I’m really not sure. I’m clearly an easy adopter of social media, I’ve got profiles on most of the usual suspects, with varying degrees of involvement. Facebook for me tends to be the most enjoyable, maybe for very reasons Twitter (and its variations like TweetChat) doesn’t attract me as much? Pinterest also holds my attention… so maybe it’s Twitter’s lack of visual stimulation? They might have caught on to that deficit by enabling you to embed more visual media into your tweets now… But then I’ve never been a conversationalist on YouTube either – which to me stands on the podium for an example of the most inane and trolling commentary on any social media space full stop. Not sure what to add to this, but Twitter certainly isn’t for me. It seems to be somewhere in between blogging and a Facebook “like” contentwise – just too little text to get something substantive going. I also get the feeling everyone just consumes these fast small attention-seeking messages which don’t get much attention overall in the end.